Andy Shallal's bookstore cafe has earned $14 million a year, yet he can't get a loan to expand. Washington (CNN) -- Andy Shallal's small business is a rare success in a sea of hard-luck stories. The owner of several popular bookstore cafes, called "Busboys and Poets" in the Washington area, Shallal said his annual revenue tops $14 million. But the success hasn't persuaded his bank to give him the loan he wants to expand two of his stores and add 40 employees. Shallal said the only way his bank would lend him money was if he used his home as collateral. 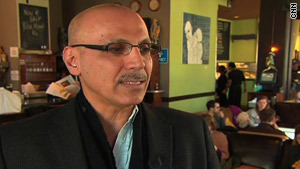 "I want to have a loan that's really a business loan that's going to use my business as collateral," Shallal told CNN. "And I was told no, in these economic times it's very difficult for banks to give money this way." Small-business owners across the country have voiced similar frustrations, complaining that -- despite billions of taxpayer dollars in relief funds and exhortations from lawmakers to help Main Street -- banks are still holding back on loans. President Obama will tackle the issue Monday when he meets with bank leaders to discuss upcoming financial regulatory reform. He is expected to push banks to increase small-business lending, along with a host of other reforms to the industry. But industry analysts say the liquidity problem won't be easily solved. One small-business expert said stricter government regulations have pulled banks in two directions. "The banks are going to say, 'Look, it's not like we don't want to lend, it's that we're constrained from lending as a result of the new focus and the new attention from the crisis," said Anne Mathias, an analyst with Concept Capital. "[They will say] 'the regulators are telling us you need to be more careful, you need to have more capital, your capital needs to be more liquid.' "
Scott Talbott, who represents some of the country's largest financial firms at Financial Services Roundtable, said banks are still lending, but they've gotten more wary of potential risk. "You've seen an increase or a tightening of the credit standards," Talbott said. "So banks are cautious now about lending in terms of who our borrower is. We're looking to make good, solid loans that can be repaid." He said financial institutions are also wary of the legislation moving through Congress that would impose new regulations on the industry and, Talbott said, make it costlier for banks to operate. The House passed a sweeping financial reform bill Friday, and a Senate committee is working on similar legislation. White House officials told CNN that when the president meets with top bankers Monday, he will insist the reforms are necessary to prevent another fiscal crisis. Meanwhile, Shallal hopes lawmakers take action soon. "You've got to really give that money back to the source that's going to provide the most amount of jobs, the most amount of economic stimulus for the economy," he said. "That's small businesses."